A lot of our reviews are based on small groups of people........2 to 4......but what if you fancy a family get together? This dilemma was one Clair and Dean faced recently. With a huge extended family, we needed a table for 25 people, somewhere child friendly and reasonably priced food. When researching this, it became apparent that a lot of places have separate rooms which can be booked for around the £50 mark (that's before food) but then Clair stumbled upon The Hungry Horse chain and The Farmhouse pub in Portsmouth. The staff were very good over the phone helping with our enquiries and could book for large groups easily. 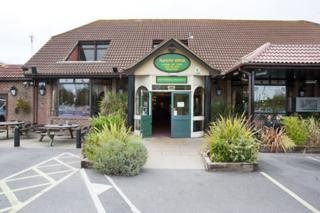 Dean and Clair went on a pre- visit to check out the food and what was available and were pleased when a member of staff helped them to book the table. We were told we would have the Executive suite with "your own private bar" and widescreen TV. With no deposit required, and a play area for the children it seemed ideal. So it came to the day.........25 people and a baby in tow the family arrived ready to eat. Ready to go in our executive room with "private bar"!! Not that private with the other 30 odd people we shared the room with!! Not made particularly clear there. We were told to let the team know when we were ready and they would get our food (which we had pre ordered) We were then told there would be a 30 min wait. Not a good start, especially when we could only book a 2pm table in the first place. The food was good - good sized portions and cooked well. Unfortunately poor Clair had a dirty plate, but at least the food all came out in time. You had to feel for those having roast dinners though as they had to go to the carvery to get their food whilst everyone else was served at the table, especially as it was a bit of a trek to the carvery area. The food went down ok, but then once we had finished we had to ask for our plates to be cleared as the desserts started to arrive.........and the wrong ones at that!! For a pre order this was not a good sign at all!!! 10 minutes later nobody else had their desserts, just 2 of the children, so a member of staff had to be asked where they were!! Finally, they arrived......with the correct puddings this time and the children's desserts again!! The facilities were awful.......the ladies toilets had wet toilet paper thrown on the ceiling, the heating was on full blast and the hot tap is far too hot for adults, let alone the children!! It was good to have the garden right by the room so the children could play out in the sunshine and the food wasn't too bad, but we have to mark down for the service and state of the facilities in true Grubgang fashion!! The food is ok if you remember you get what you pay for and in terms of getting a huge group in its great.